When a person has all five elements, he or she has made the change successfully. When a change is not implemented, it is usually because one or more of the five blocks is missing. Why do we need to see executives supporting a change? Why do we train people? As the answers to these "whys" became clear, what emerged were the five key building blocks of ADKAR. Prosci then began extensive research to validate and refine the elements of the model that is used today. If you have ever watched someone make a change successfully in their life or at their job, you have seen ADKAR in action. Think about the first thing someone needs to make a change: an understanding of why the change is needed in the first place. ADKAR is so easy to learn that many reflect that it seems like common sense. The letters are simple to remember, and the five building blocks become second nature once you are exposed to and apply the model to something meaningful to you. In Prosci's certification program, we begin by applying the model to a change outside of the work setting. This is the fastest way to see the model come to life, and many times that first personal application is what helps solidify the model. Once you have applied it to a non-work change, you can quickly begin applying it to changes going on at work. Once you've seen one change through ADKAR glasses, you cannot help yourself. You begin seeing change in terms of awareness, desire, knowledge, ability and reinforcement®. When you write an email to a colleague, you start to ask yourself: have I provided the information needed to create awareness of the need for change? When you read the newspaper, you begin evaluating whether a knowledge effort was preceded by the necessary awareness and desire. When you work to make a change in your personal life, you break the change down into the five ADKAR building blocks. Seeing change through ADKAR glasses means you have a new perspective on what change requires and what is needed for a change to be successful. Some individual models of change are descriptive, observing how an individual navigates a change around them or to them. However, ADKAR is prescriptive. It defines the elements that must be present for a change to be successful. Because it is outcome-oriented, ADKAR drives action. It provides a map of what needs to be done to advance a change rather than just describing how someone proceeds through change. 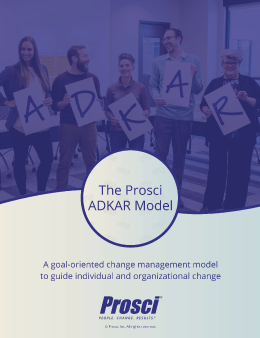 This is a fundamental shift in thinking, moving away from thinking in terms of change management activities to the goal of change management, as defined by the ADKAR Model. In the end, change happens one person at a time. Even large, complex organizational changes are only successful if the impacted individual changes how they do their day-to-day work. Organizational change is the culmination of many individuals moving from their own current state to their own future state. Since change happens one person at a time, a model that describes individual change is powerful and necessary for change management practitioners. It is not enough to understand how to make a nice-looking newsletter or outline key talking points for a kick-off meeting. You must understand how to support a single individual through change in order to have context and purpose for your change management activities. ADKAR: a Model for Change in Business, Government and Our Community describes the secret to successful change as “beyond the visible and busy activities that surround change. Successful change, at its core, is rooted in something much simpler: How to facilitate change with one person." This is the crux of why an individual change management model like ADKAR is ultimately the cornerstone of any successful change effort in an organization.